Well folks, we’re in a web 2.0 world these days and Twitter is a wonderful example there of. With that in mind Cocktail Hacker now has its very own Twitter account. If you’re a full fledged tweet head you can follow CocktailHacker for updates on new posts and other general cocktail ephemera. If you’re new to the Twitter game check it out, its like a blog with updates in capsule form, a micro-blog if you will. Also, on the off chance you’d like to read more of my ramblings you can follow me on Twitter as well. 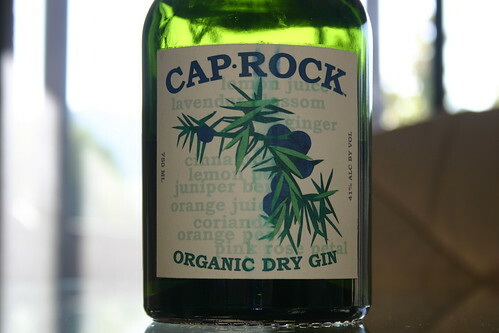 Next for our tasting panel to enjoy is CapRock Gin, one of Colorado’s first craft distilled spirits and the first certified organic gin produced in the US. This gin is produced by Peak Spirits in Hotchkiss, CO. CapRock is made from a blend of “high-desert fruits, blossoms & spices infused in an organic apple distillate.” Knowing this after the tasting certainly gives a better understand of the scent and flavor profile that this gin presents. CapRock’s nose presents a very fruity aroma which we were best able to classify as smelling most like watermelon Jolly Ranchers. The flavor expands on this. The fruity flavors are still present which I would think are added to by the use of apple distillate as the base. In addition a unique but light juniper flavor comes through that can nearly be mistaken for rosemary. Overall the flavor is very complex but not unpleasant. Since this gin is so complex I think it would be best suited for use in a super (completely) dry gin martini or straight up/on the rocks. CapRock is distilled in small batches so its likely your bottle will vary slightly from mine. This week is X-mas week and if your schedule is anything like mine then you’re busy, possibly exceedingly busy. I’m going to take a bit of a break this week. Like Thanksgiving week I’ll be making a drink, I just won’t be spending a huge amount of time on it. This week I want to create a tasty hot apple cider cocktail. I’ll check back in later in the week and let you know the results. I hope everyone has a great holiday week. I came to an interesting realization this week due to my experiments with the Martinez. When I really enjoy a cocktail I find myself making it over and over again, trying recipe variations and noting the differences. In the case of cocktails that I’m not in love with I tend to shy away from making them and even make other drinks instead. This was certainly the case with the Martinez. I tried three recipes which covered the recipe spectrum and I didn’t love any of them. The drink is okay, but I’m certainly not going to be switching to it from either a Martini or a Manhattan. I started the week with Jerry Thomas’ recipe which utilizes a ratio of 1oz:2oz (Gin:Vermouth) with 1/4 oz of Maraschino liqueur and 2 dashes of Angostura. I used my go-to gin, Plymouth, but sadly found that its flavor was completely covered by the other ingredients. 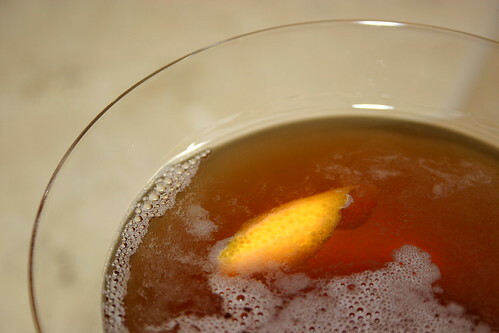 The herbal notes of the vermouth were certainly the star with this recipe even covering the Angostura for the most part. Interestingly the Maraschino did shine through and I found this to be the case with all three recipes. Next I tried Gary Regan’s recipe from The Joy of Mixology . This recipe reversed the ratio to 2:1 with the same amount of Maraschino and bitters. Again the Maraschino shined through adding its funky cherry flavor. The vermouth is toned down with this one and the flavor of the gin and bitters are able to come through. Finally I tried a tweaked version of the recipe listed in the Difford’s Guide . The ratio here is 1:1 (1 1/2 oz each of gin and vermouth). This mix provides the most balance between the gin and vermouth flavors of the three recipes I tried. The Maraschino and bitters are still present but not overwhelming. The Difford’s recipe calls for Cointreau, but I think the Maraschino adds a more interesting dimension of flavor. This version is certainly my pick. 1) Combine ingredients in a shaker over ice. 2) Shake until well chilled. 3) Strain into a cocktail glass. Although this cocktail isn’t terrible, I noted in one of my tastings that I really don’t think its a cocktail that I’ll find myself craving. It just isn’t that great and there are cocktails that are great that combine similar elements. If I’m wanting a sweet vermouth cocktail then my choice is going to be a Manhattan and if I’m looking for a gin and vermouth drink then the Martini is the winner. The Martinez may have been there first, but the Martini reigns supreme. Although, if you are going to mix one of these up, I would certainly recommend trying some of the Hess House bitters that I discussed earlier in the week. I found that their flavors worked really well in this application. Finally in an extremely timely Wall Street Journal article Eric Felten discusses the evolution of the Martini, Martinez and Manhattan. As Eric points out the original Martinez recipe calls for Old Tom gin, which until quite recently was no longer available. Hayman Distillers in the UK have recently revived an old family recipe for the sweetened gin. When I get my hands on a bottle I’ll be sure to try the Martinez again. Plymouth was the next up for our Gin tasting earlier this year. The nose is crisp with little alcohol burn. The scents you first pick up are light juniper followed by a nicely intense citrus aroma. Interestingly enough the flavor reverses that order. First you get the citrus then the flavor broadens to include the juniper and other botanicals. Finally, Plymouth’s finish is a very pleasant juniper flavor. 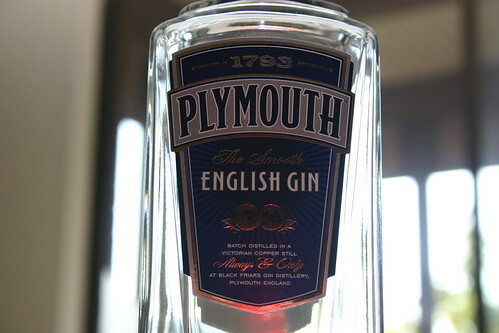 Since the time of the tasting Plymouth has become one of my favorite gins. I really like the way the flavors are bold and pleasant but not over powering in anyway. This gin plays well with both drinks needing a citrus gin and those where a juniper forward gin is prefered. To sum it up Plymouth is my go-to gin when starting cocktail experiments. The Plymouth distillery also offers a Navy Strength version of their gin that I’m excited to try but haven’t found a bottle as yet.